Color Pencil Drawing of Bulbul! HomeColor Pencil DrawingColor Pencil Drawing of Bulbul! 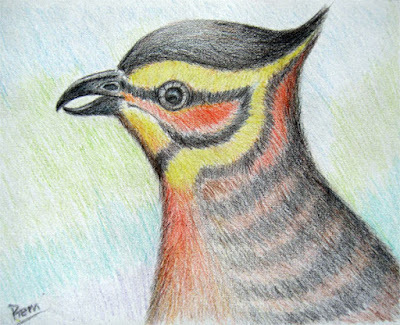 Here is my color pencil art of Bulbul - a type of bird. I made it from a black and white sketch, and that is the reason behind using imaginary colors which are looking quite complementary. I made it in 17.5 x 14 cm chart paper using the Nataraj Color Pencils. If you are curious why I am using color pencil medium instead of using watercolor or oil paints, I would like to share some useful lessons with you which I learnt at WetCanvas. First, the mediums doesn't matter. I am doing this using the colored pencils which the children use as a first set of mediums to color their drawing. Yet, I can see some beauty in this art. The knowledge of highlighting and shading and perspective are more important than which medium of expression is used. If used correctly, the arts look beautiful in any medium. Second, learning the techniques can enhance arts greatly. Same techniques I discussed above, highlighting, shading, and perspective, if used correctly can make your art shine even with little efforts. Other important techniques include varying tones and color mixing. With these techniques you can make arts even more real and vibrant. Third lesson I learnt is that joining online forums like WetCanvas is a great way to get motivated in your work. So, search for some suitable forums and post your work. You will get comments, suggestions and critiques on your work from experts, or at least the people in the same field. This can help you improve your art skills as well as remain motivated in your work. That's all for now. I will be sharing more works, and my experience, in the days to come as I explore the various dimensions of art.